I created this pasta salad for my brother Steve’s Independence Day barbecue. I needed to bring a side dish that could sit out safely in the hot sun for several hours, and also fit in well with an American style cookout. An additional benefit is it gave guests a vegan option, and me an excuse to eat lots of cold pasta salad. The vinegar base in this recipe would pair well with homemade buttermilk fried chicken, or even a store bought rotisserie chicken. Puree the ingredients together in a small processor or blender. Set aside. 1. Boil the pasta according to the package directions in heavily salted water. Drain and rinse in cold water. 2. Meanwhile, prepare the Sherry Shallot Vinaigrette. 3. Toss the pasta together in a large bowl with the dressing and the rest of the ingredients. Salt and pepper to taste. Serve immediately or store covered in the refrigerator until chilled. Notes: Next time I might throw in some dried or fresh parmesan, and a handful of sliced olives to add another element of flavor. Shredded asiago cheese might also work well. Looks and sounds awesome. I love the presentation! 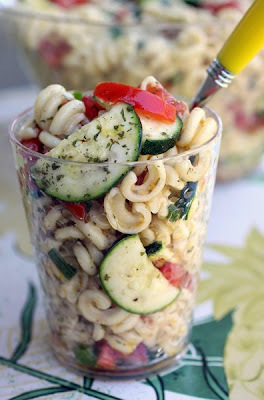 Gorgeous pasta salad. Don't you just love a vinaigrette made with sherry vinegar? How did the pasta salad go over at the event? I do, vinaigrettes in general are so versatile. It went over pretty well, but there was so much food there we barely dented anything! I think my brother’s fridge is still packed. I guess they won't have to cook for awhile lol. It is beautiful and is made with all things I love and i especially love the glass serving idea. I love the way you served this! Such a great idea! Hi Laura, thank you for the sweet words about my baby, doesn't she looks big? I am already planning her 2nd birthday party, I can't believe it. I am excited about your upcomming post,100 post already,WOW!! and nervous, I am there some how? just love it!! and the macaron cookies too, they are my favorites. I haven't forgotten about Leche Pinito, I can't wait for you to try it, it will arrive soon. Of course you know my excited news!! This looks like such a delicious summer salad. I am always looking for something that is different than what is to be expected in the department of side dishes. This looks amazing! We usually BBQ once a week so this will be on the menu for next week's evening of grilling! Thanks so much for sharing! I hope you like this one Stacy. It's such a plain old pasta salad without any bells and whistles that I'm a bit nervous! Maybe you can add some cheese lol! That sounds fantastic! Great way to use garden veggies. Thanks for sharing! Nice blog!! Check this out. How did you know I just purchased a bunch of zucchini? I love pasta salads and this one looks so good. The pictures of course are amazing! I will have to try this. How about a red or a white wine vinegar? Just about any vinegar you would want to dress a salad with might work well. made this tonight. wonderful. loved by all. thank you.